Each 2xLP is housed in a heavyweight old style tip on jacket with an authentic Japanese OBI strip. Vinyl Side A: Tracks 01-09 / Side B: Tracks 10-18. Vinyl Side C: Tracks 19-21 / Side D: Tracks 22-24. 4: "どせいさん" Hot Spring Pink. Note: This product only ships to North America and Europa. 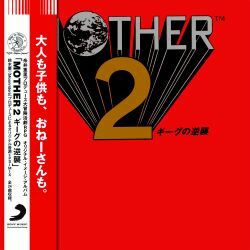 USgamer: "Mother 2 Soundtrack Reissue Review: It's EarthBound, for The Record"